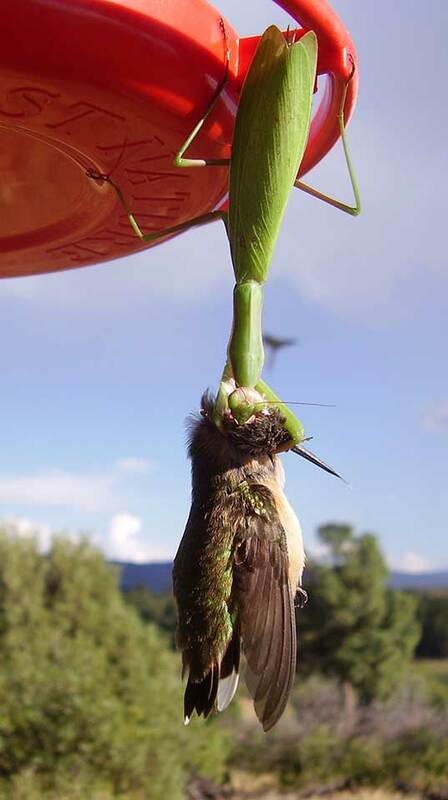 A Praying Mantis has been photographed killing a hummingbird and eating its brain. As if that wasn’t freaky enough, it turns out that this wasn’t a one off – all around the world Praying Mantises are participating in similar behaviour. Researchers at the University of Basel, Switzerland have just released a paper titled “Praying Mantises Hunt Down Birds Worldwide.” And in the paper they provide evidence of the insects performing carnivorous acts on birds all across the world. Praying Mantis are particularly fond of hummingbirds and eat them after they have got been caught in bird feeders or plants. The Freaky has been told that the Praying Mantis normally burrow through the bird’s eyes, before piercing the skull and feeding on the bird’s brain tissue. “They just hold [their prey], and they eat them while they are still alive, slowly and slowly until there is nothing left,It’s really impressive.” says retired forensic ecologist Dietrich Mebs from the University of Frankfurt in Germany, who wasn’t involved with the study. The Freaky love hummingbirds particularly this snoring hummingbird so we are genuinely upset by this news. But it just goes to show how weird and strange the natural world is.